In any sport or practice, it's our weakest part that holds us back. In my yoga practice, some days it's my tight hips, some days it's my weak shoulders, but always, always, it's how often my hands slip on my mat. I've been on a quest for a solution to sliding hands for awhile. Most recently I tested Yoga Stick-e Gloves. These solved the problem well, but there has been a problem with durability -- the Stick-e part has begun to shred. So I was intrigued to review Grip Gloves by ToeSox, provided to me for purposes of this honest review. 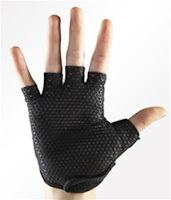 Grip Gloves, a tad bulkier than Stick-e Gloves, are more durable than and I believe they will last longer. They keep my hands from slipping during downward dog, a stock pose. They come in three sizes and the one I chose fits my hands well. I only wish that Grip Gloves came in the color of my skin tone so that it's not so obvious that I am a sweaty-hands yogini. $22 at ToeSox.com, with my thumbs up for yoga, Pilates, spinning, and other gripping activities. ToeSox also makes -- wait for it -- gloved socks. Why do we prefer gloves for our hands because of the dexterity they lend us, but tolerate mittens for our feet? Toes that aren't cramped and smushed together allow for better balance and circulation. Instead of treating our toes as one unit, ToeSox "encourages the toes to separate thereby activating the muscles in the feet." ToSox are recommended not only for yoga, dance and Pilates, but also for running, cycling, and other activities during which you'd wear an athletic shoe. ToeSox sent me a pair to try out so that I could report (honestly, of course) my experience with them. ToeSox come in full-toe or half-toe -- I chose the half-toe. They come in a variety of solid colors and stripes, and of course I chose the purple/lavender combination. You can choose to have grippers on the sole or not (mine are with). And finally, there are both crew and ankle height (mine are ankle). I know that some of you are not fond of the sensation that comes from having separated toes. I, however, find it freeing and stabilizing to spread out my toes. In yoga, it gives my small feet a slightly larger platform on which to balance my body during Tree, Eagle and Warrior 3 poses. There is a support band around the arch which helps relieve the fatigue that can occur during these balance poses. Like their upper-phalange partners, the Grip Gloves, I give ToeSox a thumbs up. $15 at ToeSox.com. Giveaway! ToeSox is giving two AllThumbsReviews readers their choice of products. If random.org chooses your comment number, you'll get to select either a pair of ToeSox or a pair of Grip Gloves. How to enter? Just check out the ToeSox store and leave a comment on this post telling which product you'd like -- Grip Gloves or ToeSox. If you choose the ToeSox, tell us what color you'd like and whether you'd want the full-or the half-toe. Leave your comment by June 21 and make sure we can reach you by email. Winners will be announced in this space. Random.org selected #3, so Teri, you are the winner! We do not have your contact information, so please get in touch with us by June 25. After that we will select another winner if we haven't heard from you. Congrats, and thanks to all! Thanks for this product review! I run into issues sliding on my mat during my yoga practice and am excited that there is now a product in place specifically to help combat the slip and slide issue! No more licking my palms! ULTRA Sport ToeSox - Ankle. These are so cool! I've actually been looking at knitted yoga socks recently, but haven't bought/made any. These would be awesome for so many things! I want the Full-ToeSox With Grip, size medium, blue/green stripe. I'd get the grip gloves. FWIW, I find a big difference in friction depending on which mat I use. I have one normal mat on which I slip a bit. I have one very fancy mat on which I always stay put. So perhaps you should find some mat companies to send you different options to review and compare! I'm not flexible enough for yoga, and my toes get lonely when they're apart. :) But I do love to read your reviews about new products! I'm not a big yogi, but those gloves would be perfect for lots of other uses too - including crafting when you need some grip, or even sweaty bike riding. Perfection! I like the toesox with the half toes and think I'd like green. The white ones look kind of like ace bandages, so those are out...but the blue and green ones are my 2nd choice. ooooh! These seem like the perfect motivator for me to get back into yoga, even if just at home! Purple-stripe half-toe sox for me, please! I love the purple stripe ones but I am leaning towards the Pink crew Sox under Sox for a cause. Oh these would be perfect for when I do yoga... esp for the positions in which I put a lot of pressure on my wrists/hands. Thanks so much for the opportunity. This is really cool! I have a problem with sweaty feet and hands (gross I know :/) but I love to do yoga, the problem is I usually slip when doing the poses and it ends up being more frustrating than anything! I would love the half-toe sox with grip, the purple stripe color!